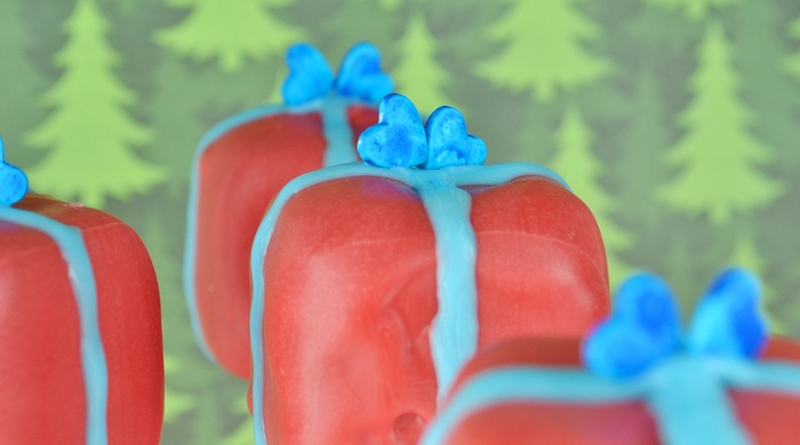 Square cake pops are a bit trickier than round or oval shaped ones. Getting the straight lines perfect is exhausting. 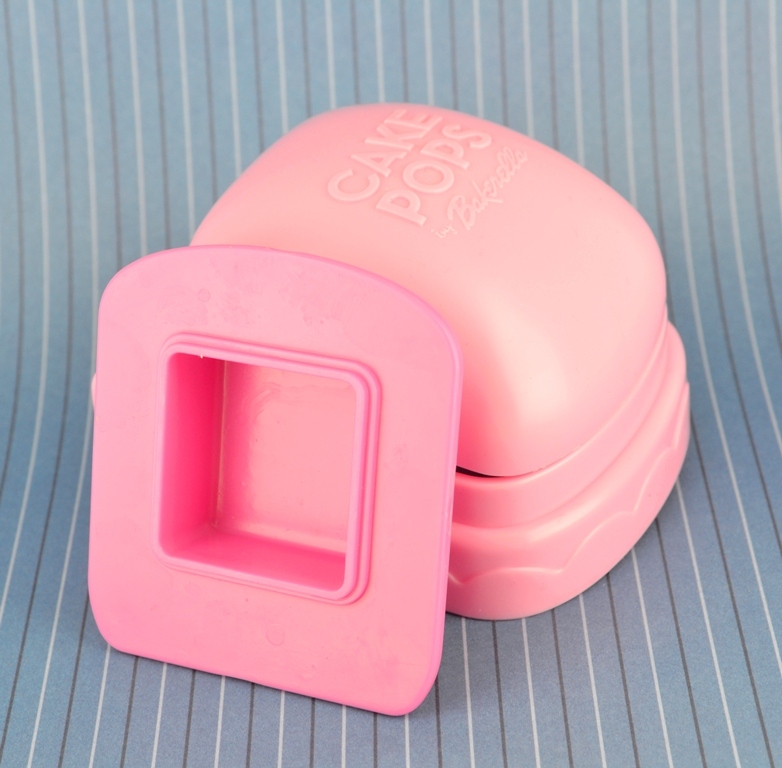 Fortunately, I have the little nifty cake pop play set from Bakerella and the extension pack too, which comes with a square mold. My second problem was: how do I do the bow? Thanks to the World Wide Web I found a solution but wasn’t sure if I could do it. It was suggested to use hearts as bows. While I do have hearts I didn’t have them in blue. Big entrance blue food colour! But painting those tiny hearts is tricky. As usual, start with crumbling the cake and mixing it with frosting until you have a nice dough. 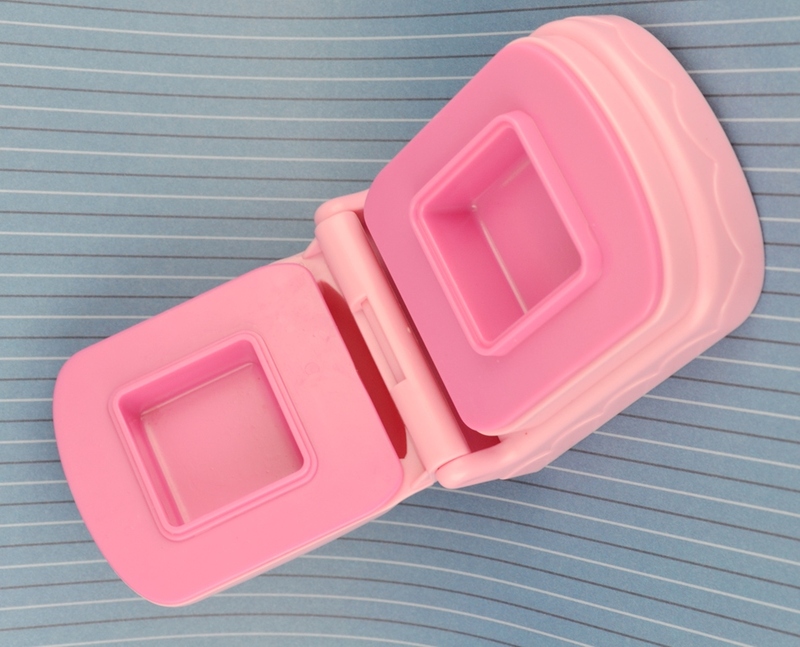 If you have a square mold, use it. If not, start with a cake ball and then start pressing the sides into squares. Something like a flat scraper can help you make sure all sides are flat. Don’t expect to have a perfect square. Even the mold is not perfect in that. 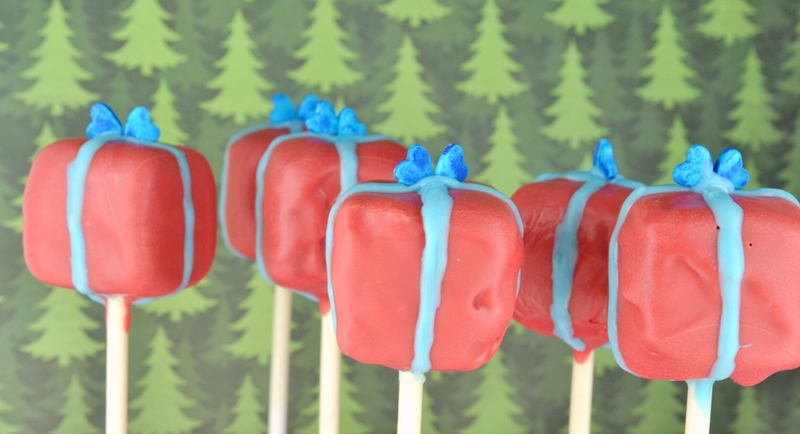 Proceed with dipping and cooling until you have the present on the stick and ready to decorate. You could use fruit strips to shape the bow, if they are very flexible. I painted the ribbon on the present and then added the hearts to shape the bow. Very simple but effective. Tip: Squares tend to crack more than other shapes, so you want to make sure that the temperature of your cake pop and the chocolate is close to the same. You will also notice that it is quite difficult to get a smooth coating on squares. Of course you can use also sprinkles to make the “paper” looks like it has a pattern.